What are you doing, 'col? Well, I'm doing laundry, which hardly bears mentioning, since I'm always doing laundry. Unless I've given up on the laundry, in which case spook is doing it. This morning he said that he had put in all the laundry last night, and I thought no way, and then I discovered that all the laundry did not include the two sets of sheets and mattress pad that have been waiting to be washed, oh, since Jacob was born. I don't want to diminish his achievement; there was a lot of damn washing to do. He also washed all of the bottles and all of the breastpump paraphernalia, no minor feat. 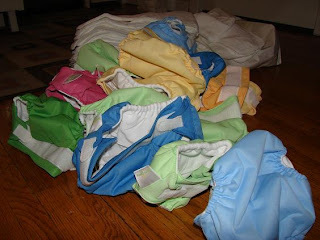 So today I'm trying to get through the aforementioned sheets, and to assemble all the diapers and put them away. For ten seconds we could have clean diapers. 1) Flushable liners. You wouldn't think this would matter much at the infant poop stage, but they cut down on the rinsing. 3) Laundry in our apartment. I cannot stress this enough. The other thing I've been doing lately is reading a lot about food. I just finished Michael Pollan's In Defense of Food. He says in the introduction that he wrote it after The Omnivore's Dilemma was published partly in response to the reader questions he received: now that you've done all this research about food production, what do you think we should eat? What do you eat? So it's two parts critique of the way nutrition science filters into the public imagination and one part his guidelines about what he thinks makes sensible eating. His ideas feel possible to adopt, unlike the dogmatic and rigid thinking which makes up so much of food discourse. Instead of feeling squashed by impossible standards, I came off the end of this book feeling inspired to change our food habits--both shopping and eating. Posted by 'col at 11:47 a.m.